Thanks for visiting my online shop! 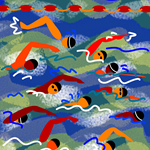 Art by D. Milan Brudvig and, right now, featuring holiday swim greeting cards! Sign up for the newsletter subscription or be in touch with questions or requests! Abstract triathletes in reddish brown and black against background colors a bit more intricate than our original design. Close up of one of our favorite designs. You are right in the middle of the action! Abstract open water swimmers are powering through the water and having a great time! 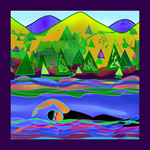 A favorite open water design by SwimMuse, features a swimmer in a beautiful mountain lake. Blues, purples and greens add to the peaceful feel. Our newest freestyle swimmer design. If you like abstract and colorful, this is the place for you. Organic Cello design, abstract cello in earth tones and grass-like background. Abstract Tri 4. Various names, but the same favorite design. So many triathletes, triathlons and Irons...so little time! Celebrate. Abstract swimmers practicing their medley strokes. Multiple colors against either a black or clear background. String quartets get to play some of the most amazing music ever written. 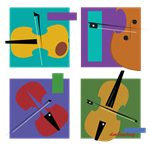 Celebrate the colorful world of chamber music.